This painting is one of three created upon receiving the Michael and Donna Griffith Lowcountry Artist Award. The pieces celebrate endangered plant species native to the South Carolina lowcountry. The name trillium is derived from the root "tri" for three because all of the flowers parts come in threes. Native Americans thought trilliums to be a powerful love potion if eaten. 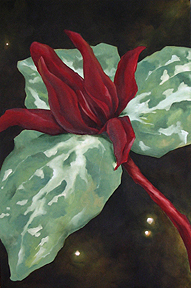 Although the Relict trillium is threatened primarily by residential development of its habitat, invasive exotic plant species like kudzu and Japanese honeysuckle also present a threat.